The Sud-Ouest SO.1120 Ariel III tip-jet helicopter flew for the first time on April 18, 1951. It was powered by a 260 hp (195 kW) Turbomeca Artouste turbocompressor, which provided compressed air for the tip jets at the tips of its 35.4 ft (10.8 m) diameter 3-bladed rotor. 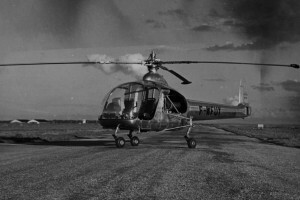 The helicopter had a conventional layout; but instead of a tail rotor, it used the exhaust from the turbine as a source of high-pressure air for directional control-in effect. The Ariel series of helicopters represented a new approach to power a rotorcraft. Up to that time, helicopters were powered by relatively heavy piston engines and associated cooling systems. Helicopter designers were desperate for ways to improve the power-to-weight ratio of their machines. Tip jets seemed to provide the answer they were looking for; but even though tip jets negated the need for heavy gearboxes and complicated anti-torque systems, it was not without compromises. The long-sought breakthrough by SNCASO creative engineers did not arrive until a turbine engine was married to a helicopter as the source of compressed air for the tip jets. As its name implies, the Ariel III was not the first Ariel in the series; and the Ariel I and Ariel II differed in design and powerplant. Only the Ariel III used a turbine engine for the compressor. The Ariel III was the first turbine engine powered helicopter to fly (albeit it was not a “direct drive” turbine-powered machine as nearly all other turbine-powered helicopters have been — see note below). Two prototypes of the Ariel III were built, both capable of carrying 3 persons side by side. The two prototypes (registered as F-WFUY and F-WBBL) flew very successfully for quite some time. In the end, the Ariel series of tip jet helicopters’ greatest contribution was that they paved the way for SNCASO to develop and produce the most successful of the tip jet helicopters, the SO.1221 Djinn. The Ariel III also pointed the way for future rotorcraft designers to use turbine powerplants as the engine of choice for helicopters. Note: The media sometimes erroneously state that the Kaman K-225 turbine-powered demonstrator was the first turbine-powered helicopter to take flight. It was, however, the first turboshaft-driven helicopter to fly; first flight was in Dec. 1951, 8 months after the Ariel III. Resources related to the SO.1120 Ariel III, provided by the Vertical Flight Society. Resources related to the SO.1120 Ariel III, provided by public sources across the internet.